Welcome to another edition of Community Checkpoint. This week we welcome the guildmaster from Dracon Trading Company, Dainan. Although this may not be a well known guild, at least not yet, or even one of the largest guilds, I never place guilds in any type of ranking system. In my opinion, guilds are just as diverse as each player. That is why I believe every guild deserves to present their message to the given game community. In that respect, we should not judge a guild by its size or particular style of playing SWTOR, within their guild structures. Dracon Trading Company, while being small in size, has some very unique RP interests, as well as having one of the more eccentric guildmasters in SWTOR. Can you tell us a little about yourself and how you got started in gaming? Well, I’d rather not talk about myself, but happy to talk gaming! I started as a college MUDder in 1997 with the character “X-Calibur” on a game called “The Forest’s Edge”. I was promptly mocked for the screen name (someone asked me if “R-thur” was about to pull me outta the rock), killed the character, and made a ranger called Dainan. He’s been around ever since on some game or another. owner of Dracon Trading Company. Not pictured: Dainan’s sense of humility. What type of guild is Dracon Trading Company and what is the primary faction base? What is the name of the server where Dracon Trading Company has set up its base of operations? We are a “jack-of-all-trades” light roleplay/casual leveling themed concept, with the idea that DTC serves as an intergalactic shipper and trader. We are set up on the Jedi Covenant server, and we are Republic through and through. How long has Dracon Trading Company been in “business?” Can you tell us how the company was founded and for how long? The rumors are that the company has dealings in smuggling, mercenary jobs, etc. Are these rumors true? If it were up to you and the members of Dracon Trading Company, would a potential third faction in the galaxy that people or companies could align with be welcomed? The rumors are flatly untrue. The very notion that a simple shipping and trading company would act as “guns-for-hire,” and go on intergalactic adventures romancing green women and making piles of credits in the process is simply absurd. What were our operatives doing on Corellia…Just trading. We didn’t take out any Imperial outposts. It was mere coincidence that we were in the GENERAL area, but I digress. So long as that third faction isn’t Imperial, we’d be fine with them. Hell, I even have an ex-Mandalorian or two on staff. Good people. Kinda sullen, but it is what it is. Aside from the RP side of things, what activities does the guild focus on primarily? How has the guild done so far in Operations in SWTOR or is this a goal of Dracon Trading Company? With the recent announcement of various customizations coming in Update 2.1, what is the guild most excited about and why? Is there something the guild would like to see in future updates not yet announced? We’re excited about all of it. Custom options mean lots of credits for manufacturers, and I just so happen to be a master Artificer. What does the Dracon Trading Company think of the new expansion, the Rise of the Hutt Cartel? What are the guild’s favorite and least favorite things in the expansion? DTC wouldn’t exist without the expansion.In order to build a good trading company, one has to have ready access to quality goods – the rarer, the better. By mastering the usage of seeker droids and completing missions for GSI and the citizens of Makeb, we’ll be able to have that ready access and, to a degree, already do. Is the Dracon Trading Company currently seeking new recruits? If so what class/advance classes is the guild seeking? Are there any requirements for potential recruits looking to join? As far as recruiting goes, we’re looking for a specific kind of player – and not too many of them, because a large guild isn’t the goal here. We want to build a quality guild with quality players that are regulars. At present, I’d love some level 55s, and I’m always hunting for good tanks and healers in training. There are also freelance options available for those looking to score a little extra cred on the side. But once I hit, say, 30 or 40 active members that’ll probably be all for recruiting. If there is someone looking to join or find out more information about the Dracon Trading Company, how is the best way for them to get in touch with the guild or its officers? Right now, the best way is either wait until we’re openly recruiting (Fleet/Coruscant) or until you get a letter from an officer. I’ve never had good luck with random requests. When we need someone, we’ll advertise. However, if anyone is interested in learning more about our guild, they can visit our website. As you have played through SWTOR, what has been your favorite quest personally and what has been the favorite Flashpoint/Heroic/Warzone or Operation to play with other guild members? I, personally, am a soloist, so I don’t group too often. But when I have it’s been pretty entertaining. Why would you recommend players look to join your guild, the Dracon Trading Company? I’m not one of those to recommend my stuff among all others just because it’s mine. I say, join us if you’re wanting a little more story, consistent guildmates and a talkative, borderline insane Guildmaster. If not, I would recommend JAWAS TOOK MY BABY instead. That’s it for this week’s Community Checkpoint. Best wishes to all the members of the Dracon Trading Company guild and thanks for allowing me to research their site for this article. I want to also thank Dainan for his time and help in answering the questions. If you are looking for a Republic guild into some light RP on the Jedi Covenant server, I would suggest heading over to Dracon Trading Company’s website or looking for an in-game recruit on the Republic Fleet. If you would like to possibly have your guild highlighted on Community Checkpoint…all you need to do is submit your guild/group’s website and some basic information in an email to me at, jason@corellianrun.com, just like Dracon Trading Company did. We love to highlight members in the SWTOR community, from guilds to the many people working to plan events, contest, etc. We look forward to hearing from you! Thanks and see you next week! 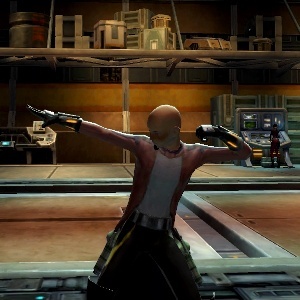 I AM ONE OF THE MOST ECCENTRIC GUILDMASTERS ON SWTOR!